The 6th and final Walleye 1000 Vintage Rally was held June 10-11, 2017 - Follow the links below to see hundreds of photos. The 5th Annual Walleye 1000 was held June 4 -5, 2016. Follow the links below to see photos from 2016! The 4th Annual Walleye 1000 was held June 6 -7, 2015. Follow the link below to see photos from 2015! 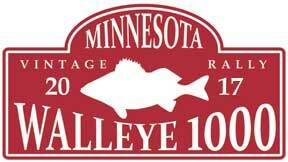 The 3rd Annual Walleye 1000 was held June 7 - 8, 2014. Follow the link below to see a bunch of 2014 event photos! The 2nd Annual Walleye 1000 held June 8-9, 2013 is over! Follow this link to see event photos! The Inaugural Walleye 1000 held June 9 - 10, 2012 is in the rear view mirror! Click on the links below for all the photos!